These men's heavyweight bibs hold their own through wind, light rain, and several seasons of hard work. They're made with our rugged firm-hand duck, which only gets better with time. The quilted arctic lining is the warmest insulation we offer, and it runs from waist to cuff. Thank you for your feedback. Please feel free to contact us at 800-833-3118 if we can assist you. Bought for son-in-law. He gave me 34 length inseam, 1-2 inches too long but didn't want to return it. Tried to exchange it locally, but was told not able to. He said he would adjust it, roll up legs, etc. Does love it though working out in the elements, roofing. Our nonprofit organization, Quota International of Iosco County, donated 5 bib overalls to the Building Trades Classroom in our County. They absolutely are thrilled to receive them. They will use them over their clothes whenever they are working on the first house they are building. This winter weather has been a challenge for the classroom and now the Carhartt bibs will keep the students warm while they are outside working on the project. These bibs are amazing everything I was expecting. In the past I have had the R41, 2 years ago I bought a new pair of R27 they are very good bibs I have been wanting a pair of R03 since after I bought them and now I have an extra pair of bibs to fall back on if need be. These bibs are super warm and most importantly “MADE IN THE U.S.A.”. Bib wise all I wear is Carhartt anything I have ever own is Carhartt they are built to last. You will not be disappointed. They fit perfectly to size I wear a 30/32 I bought a 32/32 they Are just right. In the R27 I bought a 32/32 as well they fit perfect. Thank you Carhartt! They fit and feel great. Would recommend these to anyone. I really likes the bib overalls, I will buy again, this is my 2nd pair, I live in them during the winter months. Good quality except I will be returning them and ordering a much larger size. I ordered a size larger than my pant size and they are still way to small. We're sorry to hear this. This style requires you to upsize 1-2 sizes from your midsection at the fullest part (which may be different than your pant size) and go up 1-2 sizes. Please contact us at 1 800 833 3118 if you need any assistance. You can’t get better than these and they last a lifetime. Very comfortable, durable, and warm. I wear sweatpants underneath so I got 3 sizes up than I normally wear and it fits perfectly. Best bibs hands down. Keeps you warm and last a lifetime. Had mine for 15+ years and wear at work (electrician), skiing, football games, and outdoors activities. I usually wear a 32" pant inseam but wear a 30" in bibs so they don't drag on the floor. 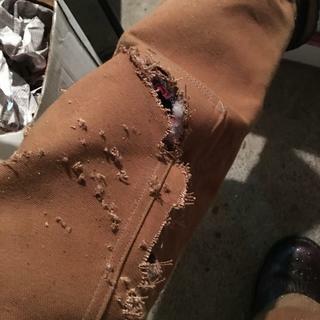 If Carhartt added a protective strip at the bottom cuff that would be a homer. Zippers up to knee a huge help getting on/off with boots. You won't be disappointed with these bibs. Great quality, super warm. A bit on the small side. I am a 34 waist in pants , and I ordered a 36 to have some extra room. They turned out to be too small and I had to buy a 38. Still a bit on the tight side but are wearable. Don’t want to go through the hassle of returning a second pair, so I will just try to lose a little weight. These are rugged and fit will. Very warm. Last night was in the negatives and was nice and warm walking the dogs. My only complaints are. First I’m not a fan of the way the shoulder straps attach on the front. Second is I wish they would offer this level of insulation with a waist length zipper. Would stop me from having to remove my boots to put them on. Other than that they are perfect. We are so glad to hear you were not seriously hurt, and we appreciate your kind words! Great quality but I wish they would come in a 26" inseam. I’m very pleased with this purchase. I always get my money’s worth, with Carhartt. You can’t get better bibs than these. Great fit and great comfort in really cold temps. Well made - will buy another pair in 10+ years when/ if these wear out. No worries about cold weather with these. These overalls insulate from the cold very well. Material seems quite durable. Fit is good. Very warm and it fits good for the size I wear. Order as Christmas gift for my husband and ordered the same size jean he normally wears - they were too small - easy return - my account was credited - received email updates - they do not exchange so we had to return and reorder a new pair - I reordered 2 sizes bigger than his jeans so he would have room - wore them to work outside pumping gas today temp was 29 degrees and he said they were really comfortable and warm. Would recommend. I used the Arctic Bib Overalls on a recent trip to North Dakota, where I spend several days outdoors in sub-zero weather. The overalls kept me warm at all times as I operated large equipment. Gave to my son for a Christmas gift! He loves them! My order came quickly and was informed of every step of the shipping process until delivered. Glad I ordered directly from Carhartt! I bought these for my boyfriend and he absolutely loves them ... Next time i get us overalls im going a size up for some extra clothes room. These overalls have already proven their worth, and from look and feel they will last a very long time. They are warm and surprisingly comfortable and easy to move around in for bring such a heavy material. Very impressed and satisfied with my purchase! Great product. I enjoy the fit and warmth. Perfect exactly what I wanted and needed! BEST ANSWER: We will have our style 102987 Rugged Flex Rigby Overall. This style will not be insulated though. We do appreciate your feedback and will forward your suggestion to our Product Design Team for future consideration. What are theain differences between r03 and r38? BEST ANSWER: The R03 will be warmer than the R38. The R38 will have insulation in the bib, the R03 will not. What are theain differences between models r03 and r38 models? Do the artic models offer substantial more protection? Can these be made to fit a 6’5” man? BEST ANSWER: Our longest inseam in this style will be 36". I have an old pair in Style #R02 but it doesn't look like those are available anymore. Which style is a replacement for #R02? Thanks! BEST ANSWER: Style R41 is the most comparable to style R02. When will you bring these back in a pants version instead of overalls, they were so good and now they are gone? BEST ANSWER: We apologize, but the Waist Overalls (B194) have been discontinued and will not be restocked. I'm a 28 waist, but I could only find 32 waist here in Canada. If I just the suspenders will these fit OK? BEST ANSWER: We apologize, but we do not make this style smaller than a 32. Adjusting the suspenders may help it fit better, but it depends on the person. 32 will be perfect for you. I wear 2 sizes up so I can wear a sweatshirt underneath. what temperature are they rated ? BEST ANSWER: We do not temperature rate our garments, but we do categorize them as warm, warmer or warmest. This style would be in our warmest category. best method of cleaning carhartt bib? All colors except Black: Machine wash warm with like colors - Zipped, Do not bleach, Tumble dry medium remove promptly, Steam iron shell only. Color Black: Machine wash cold with like colors - Zipped, Do not bleach, Tumble dry low remove promptly, Steam iron shell only. Bought a pair a couple years ago. Never worn them but took off the tags. I need a bigger size. Can i exchange them? BEST ANSWER: Please contact Customer Service at 1 800 833 3118 to further discuss your question. I am a short woman, just under 5’1”. I am interested in the men’s bib. Would a 28” inseam be too long ? BEST ANSWER: It would depend on what your inseam measurement is. Some people have a longer torso and shorter legs, or vice versa. Please feel free to contact Customer Service with your measurements for further assistance. Are they insulated in the chest area? BEST ANSWER: This style is not insulated in the bib area, just from the waist down. I have an old pair, tag is gone and I need to order a new pair. The old ones I have measure 20" across outside waist and 29" down outside in inseam. So what what size would they be? BEST ANSWER: Please contact Customer Service with your waist, inseam, and chest measurements for further assistance. what is the difference between these and the sandstone quilt-lined bibs? BEST ANSWER: The outer fabric of the R03 will feel stiffer/less broken in than the sandstone duck outer fabric of the R27. In addition, the lining of the R03 is arctic quilt, which we consider to be warmer than the midweight lining in the R27. If I wear a 33x30 what size should I look at? BEST ANSWER: For this style with a 33 waist we would recommend a 36x30 for lightweight layers to worn underneath or 38x30 for heavier garments to be worn underneath. Can I spray silcone water proofing on these? BEST ANSWER: You can treat the outer shell with a Scotchguard or Nikwax product that is labeled as safe for the cotton fabric. BEST ANSWER: No, they are not Flame Resistant (FR). Can I return the R03 bibs for bigger waist size even though I order from your web site? BEST ANSWER: Please contact Customer Service at 1 800 833 3118 for further assistance with your return. What's the quickest way to break these in? BEST ANSWER: There is not a quick way, they break in with use. Mist with water and beat them with a wooden broom handle and repeat as necessary. This has helped get the "self standing" issue out of my new Carhartt bibs & coats. Wash and dry them a few times before you use them and then go out and get dirty and play hard! 10 years of use tends to soften them up and break them in, good luck. Just wear them...they break in pretty quickly just from normal wear. Wearing them while you work hard. There is a "Made in the USA" symbol in the image on the website, but there are two answered questions stating specifically that the product is imported, both answered by "Staff," so which is it? BEST ANSWER: This product is made in the USA. We apologize for the confusion. This helped a great deal, and I expect to have a need for these in the near future. I know the products are good, so imported is alright, but like to support US jobs when I can. The clarification is appreciated, as is the quick response. Hopefully this will curtail anyone else's confusion. What is the lowest temperature that the arctic quilt insulation is rated for? BEST ANSWER: We do not temperature-rate our garments, but this features our arctic quilt lining - the warmest insulation we offer. Why is there a loop on the right rear pocket? BEST ANSWER: For people that work, I.E. to hang a hammer. It is to hold small tools such as a combination square, wrench etc. so you can reach back and grab it. My husband climbs a lot at different job sites and said it can be very convenient at times. Do these come in moss? BEST ANSWER: They do not. Our Quilt Lined Sandstone Bib, style R27, does come in Moss. Please see style 101226, which features a midweight quilt lining. Would these bibs be suitable to snow ski in? BEST ANSWER: The duck fabric on the outer shell is a fairly stiff fabric that takes some time to break in. However, it is a very durable product with a warm lining. My son in law is a pipefitter and sometimes works outside on the top of a building. He says these could be too warm for him. He also uses them to go dirt bike riding. I think they would be great for skiing. Absolutely!!!! I am warm and dry all day at my job. They are easy to move around in as well. BEST ANSWER: Yes, they feature arctic quilt lining in the lower body, which is the warmest insulation we offer. Yes. And the warmest thing I've ever worn. Warmer than my expensive snowboarding bibs too! what is the difference between the red lining and the black lining? BEST ANSWER: In most of our bibs, the red lining is midweight, and the black lining is arctic quilt insulation, which will be warmer. Please note, the R27 is an exception to this as it features a midweight black lining. My husband liked the black quilted lining. Not sure about red, have not received them yet. The black lined are a warmer. They are the more heavy weight. How do I know what size to get, that is going to fit comfortably over a pair of jeans and 5 layers of long sleeve shirts? BEST ANSWER: We recommend selecting a size based on your waist measurement by using our Size and Fit Guide. For example, if your waist measures 36 inches, we recommend a 38 if worn over light layers and 40 if worn over heavy layers. Use the true fit guide on carharts web sight then choose one size larger in the waist. I ordered one size larger than my other clothes. Worked good for me.